Twin suicide bombs targeting security forces responsible for this week capturing senior Al-Qaeda operatives killed 16 people and wounded 32 others in southwest Pakistan Wednesday, police said. "Sixteen people have been killed and 32 were wounded," he said. "It was a twin suicide attack. The house was badly damaged... some members of the family were severely injured. The deputy inspector general himself is injured," he said. 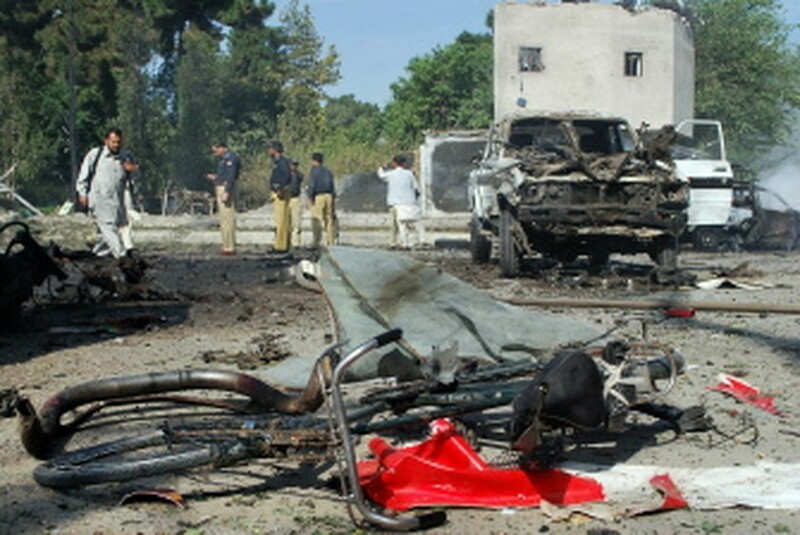 Pakistani police secure the site of a twin suicide bomb attack in Quetta on September 7, 2011. Four members of the Frontier Corps were among the dead, including a senior officer, Shakil and a local security official said, and the wife of the deputy chief and two children were also killed. The residence of the deputy inspector general is close to other government buildings and official residencies in the city of Quetta, the main town of Baluchistan province, which borders Afghanistan and Iran. The Frontier Corps is Pakistan's paramilitary force and took part in an operation on Monday to arrest a senior Al-Qaeda leader believed to have been responsible for planning attacks on the United States, Europe and Australia. Younis al-Mauritani was picked up in the suburbs of Quetta along with two other high-ranking operatives after US and Pakistani spy agencies joined forces, according to the Pakistan army. It named the two other senior operatives as Abdul Ghaffar al-Shami and Messara al-Shami. The arrests signalled another blow to the global terror network, four months after Al-Qaeda chief Osama bin Laden was killed in Pakistan by covert US forces, leading to a souring of ties between allies Islamabad and Washington. In a possible thaw in relations, the army hailed cooperation between the CIA and Pakistan's Inter-Services Intelligence agency in the arrests, news of which came just days before the 10th anniversary of the September 11 attacks. It did not say when the trio were arrested, but two local security officials said the three men were picked up early last week in a late-night operation in Satellite town, an upmarket city suburb, along with two Pakistanis. The United States also praised the operation with a White House spokesman calling it an example of partnership between the two countries "which has taken many terrorists off the battlefield over the past decade". Mauritani does not feature on either the US FBI list of most wanted terrorists or the US Treasury Department's own list of global terrorists. But Western intelligence officials from two separate countries confirmed Mauritani was part of Al-Qaeda's top team and linked to threats against Europe.